Sally has Down Syndrome and her animal friends also have special needs. Her friends work together towards a common goal driven by love and friendship. 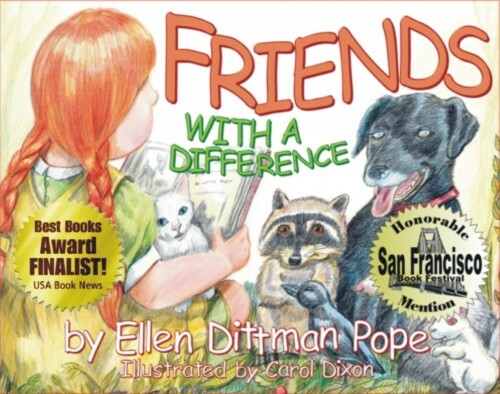 Friends helping friends is the theme of this special children’s book by Ellen Dittman Pope. Beautifully illustrated by artist Carol Dixon, the characters come to life with their message of friendship. Meet Sally and her unique animal friends who work together to make their lives better. We all have personal challenges and this story shows how understanding and love can make a difference in everyone’s life. Truly a Masterpiece I urge all educators, counselors, psychologists, social workers and administrators to read Ellen Pope’s book for the appropriate guidelines in their workforce. —W. J. Coward, Ph.D./Ed.D.